A Robin Hood Tax would be a tiny tax on the vast wealth of our financial sector; by taxing the few, we could do so much more for the many, writes Chris Keates. Next time someone says that there’s no alternative to the cuts, no money for tackling child poverty or climate change, that we cannot afford to make sure that every child in developing countries goes to school, remind them about the Robin Hood Tax. The vast wealth locked up in the financial sector, used only for gambling on the stock market or for paying out bonuses that dwarf anything ordinary people see in their wage packets, needs to be put to good use. And a Robin Hood Tax would be a great way to do it. Despite their differences over austerity and growth, even two such different political leaders as Germany’s Angela Merkel and the newly elected French Socialist President François Hollande can see the benefit of such a tax. Unlike our own prime minister – who seems unable to distinguish between the interests of City fat cats and the British people – Chancellor Merkel and President Hollande are resisting the opposition from the financiers of their own financial centres in Frankfurt and Paris. Next Wednesday, the leaders of the EU will gather in Brussels for an informal summit and a discussion about how to get the European economy growing again. The financial transactions tax (which is what people who attend informal summits call the Robin Hood Tax) will be a key part of the agenda. And Britain, once again, will be on the sidelines, lecturing the rest of Europe, regardless of the fact we’re back in recession, while despite all its woes, the eurozone isn’t. It is time we joined the mainstream and started talking seriously about how we can make sure our bloated finance sector pays its fair share; how we can rebalance the economy so our best and brightest students go into careers that make more than money; and how we can fulfil our commitments to education for all in Africa and beyond. A Robin Hood Tax would be a tiny tax on the vast wealth of our financial sector; by taxing the few, we could do so much more for the many. 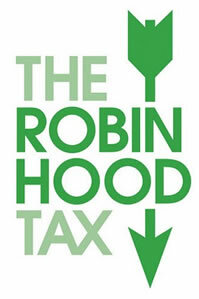 For more information, visit www.robinhoodtax.org.uk.